All of us, Hilary says. That includes all generations, all genders, parents and non parents. We all have role in raising the children of our nation. I have been dismayed to see that in the two editions of RTE Primetime that to date have discussed the crèche situation following the broadcast of ‘Breach of Trust’ have had all female panels. This may give the impression that childcare is just a women’s issue, which is clearly not the case. It is not even just a parental issue. The care of our youngest and most vulnerable citizens is something we all should have an interest in. Even if you hate children please remember they are our future. They will be paying our pensions. I welcome the current discussion we are having as a result of the excellent expose by RTE’s investigative unit. However I am dismayed by the regular (almost constant) linking of this debate with working parents and working mothers in particular. Childcare should be about what is best for the child. If we continually link the issue of full time care with the issue of women in the workforce we are doing our children a grave disservice. One of the possible reasons that we have had the explosion in recent years of the ‘industrial’ (for the want of a better word) type crèche businesses is that society (our village) seems to want a custodial arrangement for children where they are fed, watered, changed and rested while their parents are at work. These kind of crèches are fine in shopping centres where older little ones (usually they must be toilet trained) are can be dropped off for a hour or two while their carer does some shopping. But I am very unsure that the crèches such as the type we saw in Breach of Trust provide what is best for our children, especially the very young. I don’t say that lightly. I am a mother of three and all of my children attended crèches – full time for varying lengths of time. When my eldest was born I was a single parent living at home with my parents. So I didn’t have the option of having someone coming into my house. Therefore it was either a child minder or a crèche. I chose a crèche. Anyone who has cared for small children will know what a difficult job it is. It is emotionally, physically and psychologically testing and at times it is mind numbingly boring. I know I sometimes snapped at my kids when I shouldn’t have. I have shouted. I may have even cursed. But like most parents I imagine, when that happened I was always so horrified and so immediately full of remorse that I usually then smothered said child in affection. Something I didn’t see happen in the Primetime programme. But it was precisely because I know how difficult looking after small kids is that I thought a bigger environment where they were not at the ‘mercy’ of just one minder would provide a safer environment. But towards the end of my time using a crèche I began to feel that maybe I was wrong. At the time I nearly thumped him. How very dare he? I was exhausted from working full time, with three kids (one a teenager and two pre schoolers in fulltime day care) but I loved my children and was doing my best. I was very sensitive to criticism. As I sat in his office, in shock, trying to contain to urge to run, he calmly told me that very young children’s immune systems are not strong enough to cope with being in a close environment with other ‘stranger’ children of the same age. “There’s a reason children don’t start school till after 3 years” he said. So if I had to make decisions about the care of my precious babies again I would probably plump for a good childminder. A woman who could preferably come into my home or if not whose home I felt was a cosy, warm, safe domestic environment where I would be happy to spend a day. So as we continue this hugely important debate can we focus on the children and their needs and not those of working parents. Can we question if a large crèche with children separated into zones is really the best thing for our very youngest children. And most of all can we remember we all have a responsibility to our youngest citizens. Yes I do believe it takes a village to raise a child. Our community is led by our politicians who we have voted into power. We have a Minister for Children. We had a referendum on children’s rights just last year. But I am not sure that our government have accepted the old African wisdom on childraising. I am not sure that they feel they have a responsibility to spend some of our money on ensuring that whatever option parents decide is best, that the care our children get is the very best and nothing short of that. We need to keep talking, we as working parents need to curb our extra sensitivity to perceived criticism, we need to keep searching for the best answers and to keep listening to each other and to our children. Then we need to demand that childcare services are properly funded. 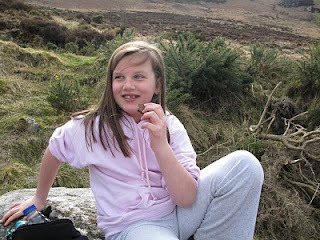 Way back in 2006 my eldest daughter, Carla sat her Leaving Cert. I wrote this letter which was published some years later in the Irish Times. I am reproducing it here with my best wishes to all the mammies and daddies who are currently watching their offspring tackle the final lap of study before the exams begin next week. And to wish all the Leaving Cert students the very best of luck! A LETTER TO MY DAUGHTER….. It is 8 o’clock on a cold, autumn evening and the house is quiet. I am sitting here at the kitchen table, with my cup of coffee, in the company of Doc, the old cat. The clock keeps steady time, marking out the seconds with a deep ticking. All is well. All is settled. But my sense of peace is rattled slightly by something in the air. A vague tension stirs my sense of tranquillity. My own inner peace and the conspiring quiet of the house, allows my senses to pick up an energy which is seeping through the ceiling…… from your room. Without visiting your room, I can picture you clearly. Sitting, bent over your desk. Your face lit by the desk lamp which also drops a pool of yellow light onto the dog eared pages of your notes. Your face is tense and your forehead holds furrows of stress as you attempt to force the information from the page into your brain. In front of you, your notice board is full of post-its and timetables. Reminders of what has still to be done and highlighting deadlines which loom menacingly in the middle distance. I am so proud of the way you are tackling your study, albeit it in a room which looks as if it has just been raided. I was 18 once and I was where you are now. I can remember so well, the constant feeling of drowning slowly in a sea of home-work and study. Like you, I was sure that my whole life path would be determined by my Leaving Cert. The grand finale of my school days loomed like a huge mountain which had to be scaled alone. And I too thought that my ability to climb this mountain would determine how the world would view me as a person for the rest of my life. Oh my child….. if only you could have the gift of seeing into your future. If only you could know what it has taken me 30 years to know. Your life path is already determined. You, the person you are, is already set. This exam, once done, will fade so quickly in its importance that it will leave you wondering if you dreamt it all up. But I cannot tell you all this. Not now. You have to do what you have to do. And just now, life is presenting you with this challenge which will consume you and your spirit for the coming months. And this too is part of your life path. So I sit here at my kitchen table, decades further down the road from you and I write you this letter. I will not send it. No, I will date it and keep it safe and on the last day of your exams I will give it to you. As you embrace your new found freedom and walk proudly out of school and into the world, know that I have always known what a wonderful human being you are. Know that the world will not look for your exam results in order to understand what a kind, caring, good person you are. So as you read this, some day in June, I say congratulations to you, my daughter – you have arrived on the other side of the mountain. And as you stride from school for the last time, stop and look back at the building where you have been guided and encouraged and taught for the last six years. And behind the school, can you see the mountain. And look, already it is shrinking. I am not a big fan of science fiction. I don’t like Dr Who or Star Trek. I don’t understand black holes and the concept of a huge infinite universe melts my brain completely. But a fiery sunset can take my breath away. A rising creamy moon spills magic onto my world. There is little quite as beautiful as a shimmering tent of stars overhead on a dark night. These things speak to my soul. They tell of wonders that exist just beyond my understanding and comprehension. They never fail to move me and remind me that there is so much beyond this world; that our journey is far more than we can see or feel or touch. On the 20th of July 1969 Neil Armstrong took his ‘giant leap for mankind’ onto the surface of the moon. For decades it seemed to me that this was the pinnacle of man's achievement in space. Nothing has ever come near to wonder of that first space walk. Sure, I am aware of probes to Mars and the fact that we have a Space Station hurtling around us where all kinds of experiments are carried out. My twitter feed for the last few years has occasionally told me about ISS passes and what time it might be visible over Dublin. I think I saw it just once. It was not much more exciting that knowing the aircraft overhead is a Turkish Airlines flight from Istanbul to New York. Then on the 5th of January a tweet appeared in my Twitter timeline with this photo. The caption read Tonight's Finale: I'm not quite sure! Ireland, Wales or England, through a gap in the cloud. Where is this port town? The tweet had originated on the ISS and was sent by a Commander Chris Hadfield. Commander Hadfield had found Dublin and Ireland was just beginning to find Commander Hadfield. More stunning images followed including the one below of the moon setting over the Earth. Who knew Canada had astronauts? But they do and to borrow a line from a famous ad... If *insert beer name* did astronauts, they would do Chris Hadfield. 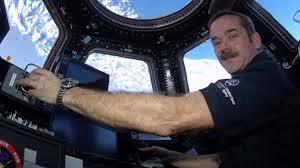 Commander Hadfield is exactly what I thought an astronaut wouldn’t be. He is creative. His photographs show a remarkable eye for composition and the words he chooses to accompany these pictures are beautifully crafted and carefully chosen. But more than that, as I quickly discovered, Chris Hadfield is an accomplished musician. I was hooked. 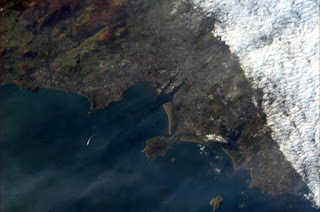 Hadfield posted photos of cities and towns and landscapes, as we had never seen them before. We saw amazing weather patterns and sometimes con trails from aircraft far below. And we saw moon rises like never before. On the 18th of February he posted a magnificent night time shot of our capital city with the words Tá Éire fíorálainn! Land of green hills and dark beer. With capital Dublin glowing in the Irish night. And an entire nation fell in love. 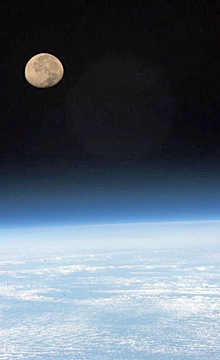 Irish in space – imagine that. He sang Danny Boy for St Patricks Day, he made videos explaining life without gravity but most of all he captured the magic and wonder of our little blue planet. He showed us a little of what he could see from his ‘tin can in space’. There have been many nights in the last six months when I have gazed skywards. I could have been putting something in the bin, or locking the car or calling in the cat and I have smiled, knowing that up above my head somewhere was the charismatic Canadian with a guitar. An astronaut with the heart of a poet and the soul of sage. Commander Hadfield, a man of science, sees the wonder and the magic of our universe and of our planet. But more than that, he knows exactly how to capture it for us so we can get a taste of the magic, the beauty, the wonder back here on earth. Thank you Chris for sharing... it’s been wonderful. Yesterday we lost our beautiful little 'kitty'. She was ten years old and until Monday she had been very well. Kitty was a wonderful cat - with a coat as soft as feathers and a girly meow which sounded more like a squeak. She was part of our family and we are all very sad that she went so unexpectedly and so early. We never knew she had a huge tumour. She died peacefully at 7pm yesterday helped on her way by our Vet and in my arms. As a tribute I have edited two previous posts from the archives. She enriched our lives for a decade. We will miss her. I am very glad that I don’t own a gun and that I live in country where it is generally against the law to own one. Because if I had a gun, last week I would have shot my dog, Dylan. He had a charming dose of the trots. This week I would shoot Mrs Blackbird. Yep, that’s right. Mrs Blackbird. I would point my gun and BANG. Feathers all over the place. And then PEACE. QUIET. Now before you rush to judgement – let me ask – have you ever heard an agitated Blackbird? They make the most annoying racket and it goes on and on and on. The problem Mrs Blackbird with this particular bird is that she is a mammy. She must have a nest full of baby blackbirds in the tree at the end of the garden. I am also assuming that this particular Mrs Blackbird was a bit sloppy when it came to doing her background research on a suitable location for her nest. She clearly saw the tree and letting her heart rule her head, decided “This is it”. “This is my tree. This will be my new home.” Had she come back for a second viewing before finally making her mind up (and had she bothered to tune into Kirsty and Phil she would have known all this), she would have realised that she was making a nest at the end of a garden belonging to four cats. 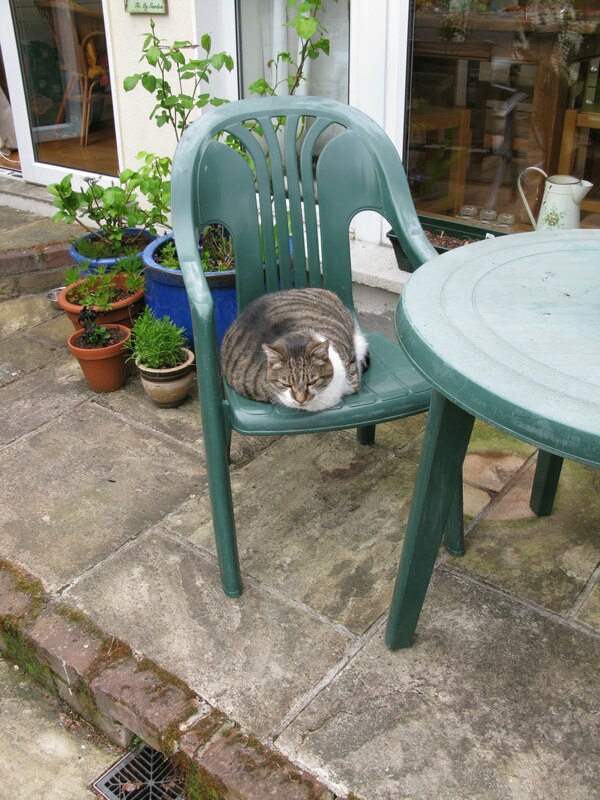 Now my cats are generally laid back, lazy moggies who venture into the garden to lie in the sun or do their business. They have a cat flap to facilitate these comings and goings. Youngest of the foursome is Kitty and she occasionally brings home a field mouse. She has never (to my knowledge) caught a bird. But anytime any of the cats venture into the garden at the moment, Mrs Blackbird comes flying out of her fabulous tree, roaring and bawling all kinds of birdie obscenities. She perches on the swing and keeps up her tirade until the cat in question retreats indoors again. But when Kitty puts one paw into the garden she goes ballistic altogether. Squawking and screeching at the top of her lungs and dive bombing Kitty as she wanders down the path. But this morning took the biscuit altogether. I was sitting at my laptop trying to work on a story. I have gotten somewhat used to the incessant squawking but all of a sudden it seemed to go up a gear and get louder. 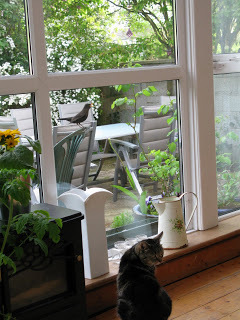 “Oh shut up” I roared as I turned around to see Kitty sitting indoors on the window sill and Mrs Blackbird perched on a patio chair directly outside the window telling Kitty exactly what she would do with her if she even put one leg into the garden. I was stunned. I will admit to admiring Mrs Blackbird’s tenacity and her dogged protection of her offspring. But clearly her hormones have gotten the better of her and I am worried for her sanity. Without a gun I am just praying that all her babies fledge successfully and soon. And that Kitty stays as lazy as she is, so we can all live happily ever after! I believe in Karma – otherwise known as what goes around comes around. The Mrs Blackbird – v- Kitty saga has continued apace since I posted ‘Bang Bang Birdie’ last week. Although I wouldn’t have thought it possible, Mrs Blackbird has upped her game. Kitty now only has to pass a downstairs window and Mrs Blackbird zooms up the garden, screeching bloody murder. Kitty’s favourite daytime haunt is Mia’s bedroom, where she either curls up on the bed or sits on the window still surveying the garden. No more. Mrs Blackbird (who clearly has a powerful set of binoculars in her nest) spots her immediately and takes up position on the outside sill, yip yipping for all she’s worth. Kitty is now terrified of going into the back garden and has taken to exiting and entering the house through windows at the front of the house. Needless to say we all think this is hilarious and have been regaling neighbours, friends and family with stories of Kitty being totally intimidated by a blackbird. “Kitty is a scaredy cat” and “Kitty’s afraid of a blackbird” echoes through the house regularly and guess who laughs loudest – yep, yours truly. What I had missed however, was the gimlet eye Kitty was throwing my way in the last day or two. Last night, Kitty clearly decided to take matters into her own paws in order to restore her feline credibility. And so she did what Kitty does best and caught a mouse. A little field mouse, which she (brace yourselves ladies) brought into my bedroom, through an open window, at 1.30am this morning. Needless to say she had chosen her moment cleverly as my other half was away. So I woke up, alone in my bed, aware that Kitty was making odd sounds in the bedroom. I sat up and turned on the light. And there she was staring straight at me, saying “scaredy cat? Lets see who is scared now?” At her feet was the little mouse. As the implications of this situation seeped into my sleep fuzzed brain, I prayed “please God in heaven may this mouse (who was not moving) be dead”. With that the mouse took off under my chest of drawers. And Kitty decided to leave him there as she vanished under the bed. By now I was up and out of bed and lifting anything off the floor that I thought a mouse might climb into (shoes, bags etc), I then opened the curtains so that the open window was clearly visible and accessible, on the off chance that Kitty might think enough was enough and remove the mouse from whence it came. Wishful thinking all. Mouse stayed put and so did Kitty. There was nothing for it but to leave them to it and hope that by morning Kitty would have done her worst and I could then remove dead mouse from the room. I decided to sleep in the spare bed in Mia’s room. But as soon as I lay down, my mind was full of what could transpire during the night. Mouse caught up in my duvet, taking refuge in my pillow, my dressing table being thrashed as Kitty pursued him across it, Tom and Gerry style. No, I decided I had to be grown up about this and go in and get rid of mouse. So I took a deep breath and woke up Mia. Mia, I should explain is my youngest. She is 9 years old and she (like us all) loves animals. But Mia loves animals in a different way to the rest of us. When she was a toddler I would regularly find her barefoot in the garden with ants crawling over the legs. She loved wood lice and made homes and cities for them. She collected snails. And lately she has been bugging me to get her a pet mouse! Mia readily agreed to be the one to remove the mouse. I equipped her with my industrial workman gloves and got a torch and we re-entered the room. All was as before and Mia on hands and knees reported that “ahh, he’s cute and yeah he is there, under the chest of drawers”. We discussed tactics which broadly speaking involved me moving the furniture and shouting instructions while Mia calmly and swiftly cornered little mouse, cupped him in her gloved hands and headed for the window from where he was launched into the night. Mia also intervened when I attempted to grab Kitty and launch her after the mouse! And so it was that at 3am this morning Mia and I were in the kitchen having a celebratory glass of juice and me handing over the €5 bribe reward to my darling, brave, heroic, animal loving daughter. As we retired back to bed, we passed Kitty on the stairs and I swear she was grinning from ear to ear! I don't think I will slag her anymore!